I know as well that everyone in this globe are love to travel around the world, to make this dream come into reality I saw some people are able to reduce their daily expenses and save it to traveling. Somebody choose to not having a car so they don’t need to pay the petrol, pay the annual taxes and insurances even others choose to not going to the club and party than save their money for ticket and accommodation. Hi this is Bima and thank you for visiting my blog, in this article I will tell you about how earn money by selling travel photos online. This gonna be so simple cause all you need to do is taking photos by smartphone or your cheap mirrorless camera than upload it into microstock company just like what I did. The main point of this chance is, you are able to earn money by selling photos rather than keep it in your computer’s drives or in your smartphone that will make it full with tons of trash. Photos are likely a properties so when you choose to hold it than they wouldn’t generate money at all, but if you put passion and hard work through it than it will deliver cents and dollar into your pocket, is it interesting? Shutterstock is a microstock and company agency that provide photos, vector, or even video footage both for commercial and editorial needs. There are millions of stock that uploaded every single day and hundred thousand of dollar that deliver to their contributors. Earn money by selling travel photos on shutterstock is super easy and here is the lists that you need to do to covert your holiday into your money source income. First is sign up your name and email on Shutterstock, it is 100% free! Submit it – once someone love your photos and they will download it and money will come even while you sleep at night. Every photo that already submit will be appear within 1-2 days after the curator decide that it fulfill the requirements, make sure you read the technical and requirement of selling photos on shutterstock. To make your work easier than I also suggest you to download Shutterstock for Contributor apps so you can write the description and keyword through your smartphone. I spend almost 2 years to figure out how earn money by selling travel photos online and I try to browse in Google or asking my friends and honestly it makes me desperate about generate money by selling photos. But today I found the way and I see the good prospect for the future from this simple things. If you could see this screenshots below than you will see my earning reports of selling my travel photos since November 2017. First 6 months is really hard cause I only upload 2-3 photos in a month, than in the 7th month which is on May I try to upload 10-15 photos per day and here you can see that my download is growing and also the money that I earned. I keep uploading 20-40 photos every day, I could say that ANY KIND photos that I have in my computer no matter it is food, travel, weddings, or any simple objects to my Shutterstock account. How much money that we can earn? When I write this post on August 2, 2018 I’ve got 856 active images, 47 download, and $24.15 of earning and once I reach the threshold of $35 than it will goes to my paypal. 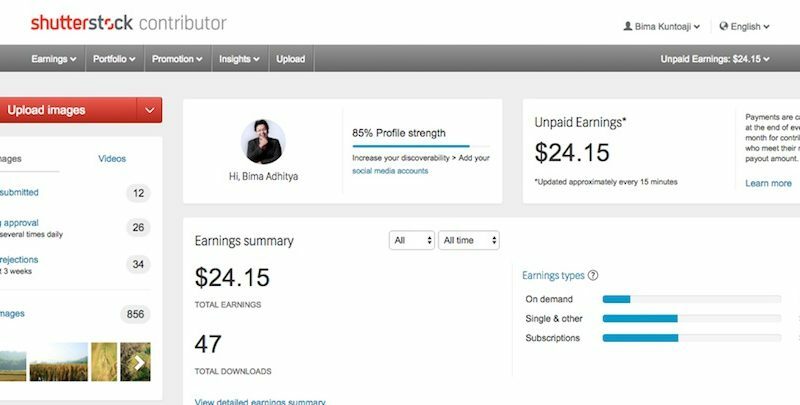 You are able to make USD0.25/download for selling your photos and the good news is it can be growing up depend on your contributors level and your buyer membership. Here below I upload my photos that already download by customers, here you can see my egg waffle photo has been sold and earn me $0.25, my tempe bean photo earn me $0.60, and my wedding dress photo earn me $8.49, so it will be vary. Before you reach $500 of earning than your minimum earning will be $0.25 just like what I said before but once you achieve $500 than your minimum earning will grow to $0.33. How to make somebody buy your photos? When I upload my egg waffle photo at the 1st time than I will write the description with ‘Egg Waffle is the best and cheap street food in Hong Kong that you can find everywhere or almost in every junction. Made from flour, sugar, and egg for sure’ than I put the keyword such as: asian, background, bakery, bread, breakfast, and etc. As I said before, you are able to upload photos taken by smartphone or any kind of camera, but here I’m focusing take a photo by my EOS M mirrorless camera. Here you may browse some gears and travel support that I used to work in this blog. Anyway thank you for read my article and hope it helps you to figure out how earn money by selling travel photos online, once you have a better experience than me so drop me a comment below. Here below are my personal recommendation of affordable mirrorless camera that I ever used, it comes with great feature and costs less than $800. These awesome tiny camera are able to help you for taking good photos and video that you can sell online.